These words were plastered all throughout movies in advertising of the Chinese-American co-production movie, The Meg. Filmed in 2017 in Sanya, China, the movie was released in theaters in both China and America on August 10, 2018. Since then, the thriller-fantasy movie has received both a number of negative and positives reviews. The film is about a prehistoric shark, known as a megalodon shark, that strikes terror to crew members of an underwater research facility and to people swimming in the Sanya Bay beach. The cast includes main characters who are research members of the underwater Facility such as: Jason Statham who plays the role of Jonas Taylor, Li Bingbing who plays the role of Suyin, Ruby Rose who plays the role of Jaxx Herd, and more. Critics say that the film is not that interesting due to the fact of its huge similarities to Jaws. They believe that The Meg copies a lot of the scenes from Jaws, but with less of the thriller of Jaws. Many critics also say that the film lacks thrill, and crazier scenes due to it being a PG13 movie. Despite the negative critics, there have been a number of positive reviews. Others say that the film is a silly summer-fun film and it meets the expectations in terms of action. 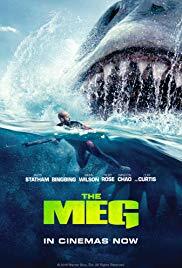 Despite the different reviews of the film, both negative and positive; The Meg is a must see. Although some scenes may seem similar to Jaws, there are plenty of scenes that differ and will keep you well interested. By watching The Meg, you will be in for a thrilling ride as multiple scene shows the terrifying megalodon shark when least expecting it.